while you stay on the inside. 7,500 die per year due to cold homes. TCosy™ is an innovative approach to large-scale retrofit. It provides a fast, low cost and highly replicable solution for a wide range of buildings. The TCosy™ dramatically reduces energy requirements, creates a healthier living environment and can be delivered whilst residents remain in their home. Why do we need to Retrofit? The UK's housing stock is amongst the least energy efficient in Europe, and is responsible for nearly a quarter of our annual carbon emissions. The refurbishment of our homes and buildings is one of the greatest challenges we face to reducing carbon emissions. With the Government committed to reducing carbon emissions by 80% before 2050, it is estimated that over 20 million homes in the UK will need a low energy retrofit to enable us to live and work more sustainably. Retrofit involves increasing the energy efficiency of existing buildings with the aim to help households save money on their bills, reduce their emissions, and make their homes warmer and more pleasant places to live. Why would I retrofit my property? 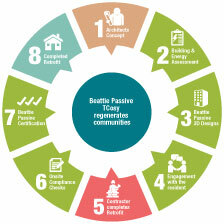 The Retrofit process has been designed to be simple and efficient for everyone involved. "Improving 20 million homes by 2050 requires a retrofit rate of more than one per minute."